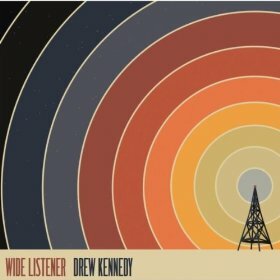 Wide Listener is Drew Kennedy's most accomplished and satisfying album yet. Drew's already excellent songwriting is augmented this time around by co-writes from such luminaries as Lori McKenna, Josh Grider and well-known sportswriter, Wright Thompson (!?). Of course there's also Kennedy's uniquely expressive vocals (which are stronger than ever) to draw you in. "Good Carpentry" is a thinking man's "my woman done left me" ballad, somehow successfully equating solid craftsmanship with the memory of a lost lover. On paper (blog), it doesn't sound like it would work, but Drew makes the metaphor go over smooth as caramel on cheesecake. "Hello Goodbye" and "Jackson Square" are probably the two cuts with the best shots at (Americana) airplay, blending immediate hooks with soulful undercurrents. They take me back to a time (late 90s) when earnest singer-songwriters with folk leanings were played alongside alt-rockers, pop-punkers and boy bands on Top 40 stations. Those nostalgic feelings are deftly pulled along by the thread of traveling and things/places/people left behind that Kennedy weaves through the album. Not that it's all wistful; on "Love on the Highway," the trip isn't taken alone. "The Poet at 33" closes Wide Listener with an introspective but welcoming look into the creative soul. It easily foregoes the usual yawns induced by songs of this ilk with honest lyrics and a melody that will stick with you long after the album is over. Wide Listener is the sound of a man who's found the sweet spot - where creativity, passion and talent all overlay each other on the venn diagram. Drew Kennedy may never be the best known singer-songwriters in the world, but with albums like this, we can rest assured he'll always be known as one of the best. Wide Listener is available for purchase on Amazon, iTunes, Drew's site and Lone Star Music.